New Zealand has thousands of species of wasp, but most of them are tiny native species that cannot sting. The wasps that usually zap us are introduced species – the German wasp and common wasp, which have invaded the beech forests. Native and introduced bees are busy pollinators, helping plants to produce seed. Wasps and bees belong to the Hymenoptera order (which also includes ants). Some species live in colonies, but others live alone. The adult female lays eggs. Each egg hatches a larva. The larva forms a pupa (a case or cocoon). An adult emerges from the pupa. Wasps have few or no hairs. The adults mainly eat sugary food such as nectar, and feed their larvae on insects, spiders and other invertebrates. Most bees have hairy bodies. The hairs are branched or feathery. They are totally vegetarian and mostly feed their larvae on pollen. This is the largest group of wasps. They do not sting. These wasps are parasites – the females lay eggs into a host, which could be the egg, the larva (such as a caterpillar) or the pupa of another insect species. When the wasp larva hatches, it feeds on the host and slowly kills it. The wasp larva forms a pupa, and an adult wasp emerges. One type of parasitic wasp lays a single egg inside the green looper caterpillar. The egg then divides into up to 2,000 embryos, and each embryo becomes a wasp larva. The larvae wait for the caterpillar to grow, and then eat it before it becomes a moth. New Zealand has thousands of native species. Most are parasitic, and help to control other native insects. Many are tiny and wingless, rather like ants. One wasp lays its eggs in the pupae of glow-worms in the forest. There are several native hunting wasps that have a sting to paralyse their prey – insects or spiders. Many live in holes in the ground. 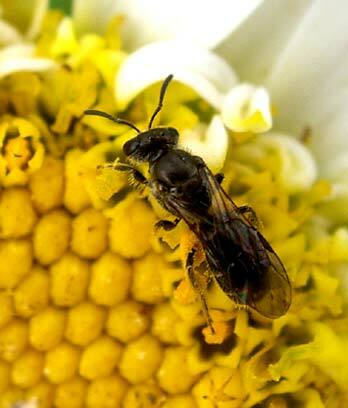 New Zealand’s worst stingers are the black-and-yellow German wasp and common wasp, from Europe. Only females sting. They sting to defend their huge nests, and take food (insects, honeydew) from other insects and birds. If you weighed all the wasps in some beech forests, they would weigh more than all the birds. Bees are important in pollinating many native plants: they carry pollen from flower to flower. Most of New Zealand’s native bees are black, and some dig nest holes in the ground. All bees collect pollen to feed to their larvae. Honeybees and bumblebees were brought to New Zealand by European settlers in the 19th century. Honeybees form a hive with one egg-laying queen, some drones (males), and thousands of workers (females). The workers build the honeycomb, collect nectar and make honey, and feed the larvae and the queen. Bumblebees also live in colonies. They build nests in dry places such as wood piles or compost heaps. They usually only sting if disturbed.